We’d love your help. 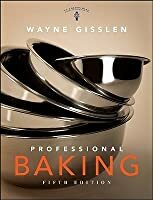 Let us know what’s wrong with this preview of Professional Baking by Wayne Gisslen. To ask other readers questions about Professional Baking, please sign up. If you're into baking at all this is essential reading. One of the textbooks used at Le Cordon Bleu, this excellent instructional book goes into exhaustive detail about different flours, leavening agents, every style of bread, pastry, cakes and even custards. You probably won't have need for another baking book once you get this, because Wayne Gisslen's Professional Baking is as comprehensive as it gets. Recommends it for: All bakers. The worst problem with this textbook is how much you have to flip around to find the complete technique to the formulas. Rather impractical when in the middle of tempering chocolate or making an Italian Meuringue. 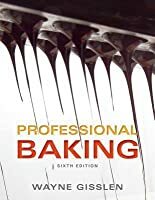 I'm not a culinary or pastry student by any means, but I wanted to learn more about baking and I thought it best to find a copy of an actual textbook used in cooking schools. This one I've found is very informative, concise, and well-written. I've come across some terrible textbooks in my time at university and at school, and I was very pleased to find that this isn't one of them. It covers a wide berth, as appropriate for a culinary textbook, and will serve as a great reference in my kitchen. 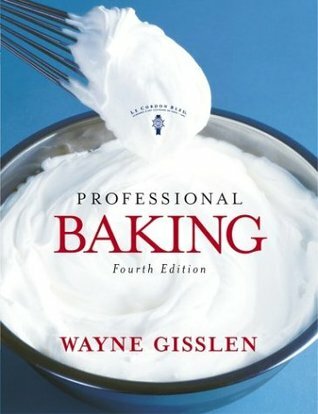 I' I'm not a culinary or pastry student by any means, but I wanted to learn more about baking and I thought it best to find a copy of an actual textbook used in cooking schools. This one I've found is very informative, concise, and well-written. I've come across some terrible textbooks in my time at university and at school, and I was very pleased to find that this isn't one of them. This is one of the book I frequently use and read all these years. Its a comprehensive book about the science of baking and it cover all the basic terms and steps in baking pastries, cakes and bread. Although I never actually use this book for the recipes but I find it provide wealth of information that you wouldn't find even in the wikipedia. The recipes started with the basics to intermediate and professional. Unlike the Professional Cooking where you don't really need the precise measurement for everything, Professional Baking is a good companion to had for beginners of cooking or culinary students. Hence why the book is rather condensed with basic instructions including introductory to the commonest items used in baking like flour, water, oil but it does provide more information like the type of flour being used in recipes, the 12 steps taken for baking a bread down to the types of chocolate you can make. It was never a replacement for the actual kitchen work with the chef but if you have a need to know the differences of Italian and Swiss Meringue or the Scottish or French method for laminated dough, this book can help you with the definition and description. Its not a must have for average bakers because of the size of the book and the overall non-specificity of the content. But if you are interested in baking, this book will help you down to the basic. So far, this is the best book that I've read in Culinary School. 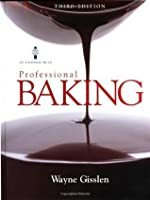 if you have any interest in baking at all, this book shows you are of the basics. Not only does it show you all of the baking basics of everything from biscuits to creme Brule to pies, it shows you how to make pretty much anything that a batter is used for like doughnuts & crepes. There are also plenty of recipes for fillings & sauces to go along with your baked goods. This one is a must for any Culinary professional. This text was included in my classes at LCB. I keep it around in part because of the recipes and the notes I took, but it makes a great reference volume, as well. Covers a lot of topics, and has a huge number of recipes. Great explanations of techniques, but there is no way in hell I'm going to use emulsified shortening. Clear instructions, beautiful pictures and fantastic recipes. Best textbook I've used so far. No re-selling this one; it's a keeper, for sure. great textbook - has a lot of information that I am constantly using for reference. Also, the formulas are really easy to use and variate and i have found some of the best recipes out of this book. one word to describe this book: bakegasm! Such a wonderful baking book. Excellent recipes. If you are in the field of cooking or baking this is what you will need. Reading this for school, I've found that it's very informative. We're using the Fifth Edition, which Goodreads doesn't have listed. I recommend it for serious bakers out there. Textbook for my pastry class- a good blend of history, terminology, method, and recipes (sorry, formulas).